Fuchs’ dystrophy (pronounced fooks DIS-truh-fee) is an eye disease characterized by degenerative changes to the cornea’s innermost layer of cells. The cause for Fuchs’ dystrophy is not fully understood. If your mother or father has the disease, then there is roughly a 50 percent chance that you will develop it as well. While Fuchs’ dystrophy can sometimes be genetic, it can also occur in individuals who have no known family history of the disease. A comprehensive eye exam is necessary to diagnose Fuchs’ dystrophy. 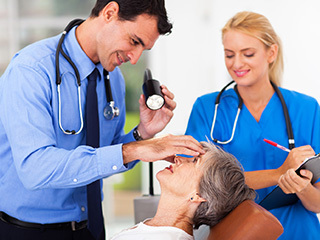 During this exam, an eye care professional uses an instrument called a “slit lamp” to examine the cornea. 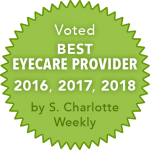 The slit lamp magnifies the cornea, allowing the eye care professional to detect the subtle changes to the cornea’s endothelium cells, which characterize the disease. The earliest clinical signs are a reduced number of endothelium cells and small, drop-like lesions along the endothelium.